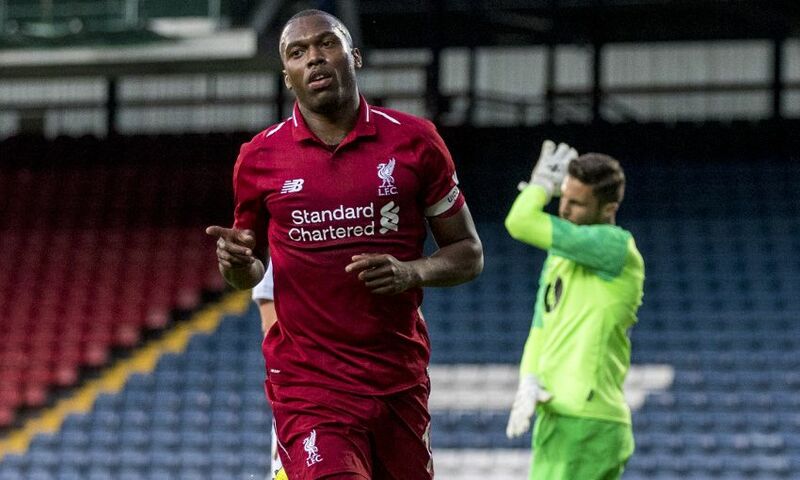 Second-half strikes from Lazar Markovic and Daniel Sturridge gave Liverpool a 2-0 win at Blackburn Rovers in their final domestic friendly before heading to the United States on tour. The Reds remain unbeaten over their four-game warm-up schedule in the UK and now jet off across the Atlantic for three International Champions Cup fixtures, against Borussia Dortmund, Manchester City and Manchester United. Sturridge’s burgeoning understanding with Naby Keita was perhaps the highlight of the match and the pair created numerous chances before the former tucked away his goal, Liverpool’s second, on 72 minutes. The Reds started brightly at Ewood Park and should have been ahead after five minutes when goalkeeper David Raya brought down Dominic Solanke for a penalty. But Liverpool captain James Milner, usually so effective from 12 yards, saw his spot-kick well saved by the 22-year-old Spaniard. The energetic hosts grew into the somewhat scrappy game and began to edge proceedings. But it was the visitors who carved out the first real chance from open play. Solanke again provided the menace, heading wide of the far post after connecting with Adam Lallana's cross from the right. Jürgen Klopp's side continued to struggle to find their rhythm against a Championship team eager to make an impression and were indebted to a smart save from Loris Karius just after the half-hour. The goalkeeper blocked Dominic Samuel's low, hard shot at the near post after the Rovers striker had broken through the left of his defence. The ever-lively Lallana responded for the Reds, hitting the bar with a chipped effort from the edge of the box, after a great run by Ben Woodburn, and then saw his close-range effort cleared off the line just before the break. Klopp made 10 changes at half-time, with goalkeeper Karius the only player to retain his place. Sturridge was handed the armband and almost broke the deadlock in quickfire fashion but dragged a low shot wide of the far post after being put through by Keita. The pair combined again just minutes later and this time Sturridge curled his effort just over the angle after latching onto his teammate's defence-splitting pass. But the Reds capitalised on their second-half dominance shortly after the hour mark when Markovic planted a shot past substitute Rovers goalkeeper Jayson Leutwiler after being played in by Sturridge. The No.15 then got the goal his performance deserved and it came via his blossoming partnership with the impressive Keita. The box-to-box midfielder won possession high up the pitch before playing in Sturridge, who took a touch and made no mistake with a prodded left-foot finish inside the far post. First-half team: Karius, Clyne, Matip, Klavan, Moreno, Milner, Lallana, Woodburn, Ojo, Origi, Solanke.